Fiat Automòveis have released first photos of the latest model to join the burgeoning "Adventure" series, new Idea Adventure minivan, which now joins the Palio, Strada and Doblò models in getting this popular off-road treatment. The Fiat Idea Adventure made its public debut yesterday at the opening of the 8th edition of the annual Adventure Sports Fair being held in the long rectangular "Biennial" landmark-building located in the Park of Ibirapuera, in the City of São Paulo, Brazil. The fair runs until 27th August. This is the latest in a series of initiatives to promote the "Adventure" range and give these off-road targeted models a distinct brand flavour of their own, and so the full Fiat Adventure range is being presented in an area that mimics the mud and sand conditions that these vehicles are able to be used to the full in. The Adventure Sports Fair is a huge, vibrant exhibition dedicated to outdoor tourism and sports, with all the leading equipment manufacturers' in this sector involved. This month Fiat Automòveis has also unveiled a special and exclusive range of outdoor pursuit equipment realised in conjunction with equipment manufacturer', Try On, and these are also being shown at the fair. Inside the Idea Adventure a new set of three horizontally-positioned round gauges (compass, turn indication and angle of slope) are mounted on the dashboard above the centre console. Aside from the three photos Fiat Automòveis haven't revealed any technical details, but its new, attention-catching visual changes can be seen in some detail. Fiat Automòveis have released first photos of the latest model to join the burgeoning "Adventure" series, new Idea Adventure minivan, which now joins the Palio, Strada and Doblò models in getting this popular off-road treament. Aside from the three photos Fiat Automòveis haven't revealed any technical details, but its new, attention-catching visual changes can be seen in some detail. The Idea Adventure's new front and rear bumpers are bigger and more pronounced, the tough new plastic sections integrating into the body coloured area below the headlights. The now-traditional Adventure models' quad mist lights, positioned in two vertical stacks, is continued on the new Idea Adventure and the front grille is moulded as part of the bumper section, integrating with it, and rising from the top of the bumper in a flush motion. The thick plastic-coloured protective mouldings continue down the side of the Idea Adventure, in a manner much reminiscent of the Idea 5Terre concept car shown at the major European motor shows a couple of years ago. Large plastic covers wrap each of the wheel arches (with the adventure models' usual visible fasteners), the sills and the lower sections of the side doors, the latter being ribbed and embossed with the "Adventure" logo. A durable aluminium protective plate, with a pronounced fitting, completes the effect as it runs smoothly along the line of the sills. At the rear the 'tough' theme continues with a bigger rear bumper and a large protective plate which wraps up onto it from underneath, which is also recessed in order to house the registration plate. Finally, the external semi-circular spare tyre well sits flush against the tailgate, but is actually hinged from below, allowing it to be easily swung clear by the user when the tailgate is required to be raised. 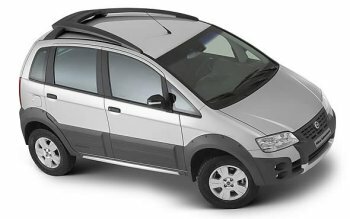 This is a very similar method to that used by the VW CrossFox (it hinges from the side though) - a model which was recently launched on the Brazilian market - and which will provide a slightly smaller rival for the Idea Adventure, although the Fiat seems to be much better designed and with greater care having been taken in integrating the styling very effectively. Other features included a v-shaped moulded roof rack (which doesn't appear to lend itself to practicality), side turn indicators located in the door mirrors, a raised ride height and the Adventure's typical chunky 5-spoke alloy wheels. 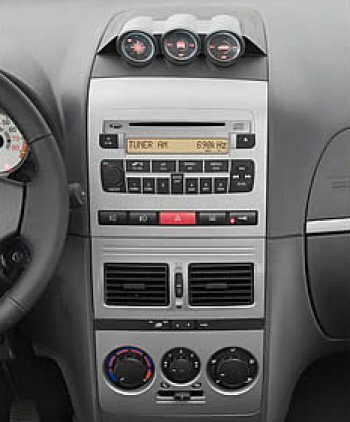 Inside a new set of three horizontally-positioned round gauges (compass, turn indication and angle of slope) are mounted on the dashboard above the centre console. 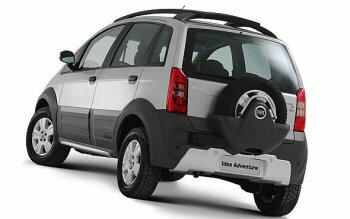 Fiat Automòveis have launched an exclusive series of the off-road targeted "Adventure" branded model range, realised in conjunction with well known Brazilian outdoor equipment manufacturer "Try On"